Our Pistachio Mushroom Mango Ceviche recipe is not like any you have most likely have ever had. Vegetarian appetizer recipes many times are fried or heavy, but this one is light, low calorie, and made from vegetables and fruits. 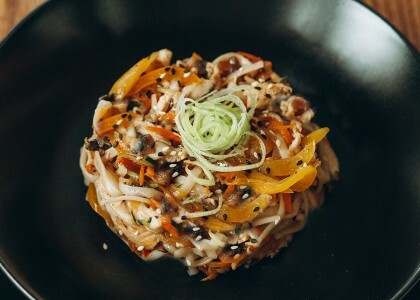 The mushroom gives the ceviche a texture like a traditional ceviche made with seafood. 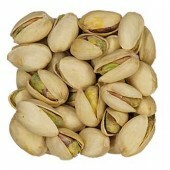 The pistachios provide an occasional crunch to compliment the taste buds. The lime and garlic combo brings a new dimension to the mushrooms and mangos, especially after it has marinated for a day or two. Cover and marinate for 8-24 hours. Place ceviche in cabbage or romaine lettuce leaves like tacos or a wrap and enjoy. You may also eat the ceviche with your favorite crackers. Pistachio Mushroom Mango Ceviche tastes 100% better than it may sound. 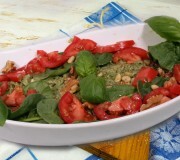 It’s so flavorful with the combination of red onions, garlic, lime, cilantro, avocado, and Eatnuts.com Pistachio. It is like a party of flavors in your mouth and the texture is similar to any traditional ceviche. It is excellent when made like a taco with cabbage or lettuce leaves. Our Pine-Walnut Pesto recipe will show you that getting a little creative in the kitchen can go a long way. Something that makes this recipe a favorite is that it is gluten free fast food at its finest. The pasta is soaked kelp noodles, and the sauce takes only a few moments to prepare when you have the right tools. This recipe is gluten free, dairy free and guilt free. Cooking with spaghetti squash is perfect for anyone who follows a gluten-free, vegetarian or vegan diet. There are so many varieties of spaghetti squash dishes you can make and they are usually very easy to prepare. 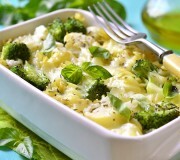 If you are vegan or do not consume cheese for any reason you may be interested in substituting cheese by adding nutritional yeast to the recipe or even trying a delicious Eatnuts.com Raw Cheese Sauce. Artichoke Stuffed portabello mushroom caps are one of the tastiest vegetarian dishes out there. 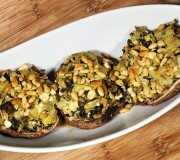 If you are looking to make some simple stuffed mushrooms, this is a great vegetarian mushroom recipe.